1/19/2018 If the mana cost of the revealed card includes , X is considered to be 0. 1/19/2018 If the revealed card doesn’t have a mana cost (because it’s a land card, for example), its converted mana cost is 0. 1/19/2018 The converted mana cost of a split card, such as cards with aftermath from the Amonkhet block, is based on the combined mana cost of its two halves. 1/19/2018 In a Two-Headed Giant game, Twilight Prophet’s last ability causes the opposing team to lose twice X life and you gain X life. 1/19/2018 Once you have the city’s blessing, you have it for the rest of the game, even if you lose control of some or all of your permanents. The city’s blessing isn’t a permanent itself and can’t be removed by any effect. 1/19/2018 A permanent is any object on the battlefield, including tokens and lands. Spells and emblems aren’t permanents. 1/19/2018 If you cast a spell with ascend, you don’t get the city’s blessing until it resolves. Players may respond to that spell by trying to change whether you get the city’s blessing. 1/19/2018 If you control ten permanents but don’t control a permanent or resolving spell with ascend, you don’t get the city’s blessing. For example, if you control ten permanents, lose control of one, then cast Golden Demise, you won’t have the city’s blessing and the spell will affect creatures you control. 1/19/2018 If your tenth permanent enters the battlefield and then a permanent leaves the battlefield immediately afterwards (most likely due to the “Legend Rule” or due to being a creature with 0 toughness), you get the city’s blessing before it leaves the battlefield. 1/19/2018 Ascend on a permanent isn’t a triggered ability and doesn’t use the stack. Players can respond to a spell that will give you your tenth permanent, but they can’t respond to getting the city’s blessing once you control that tenth permanent. This means that if your tenth permanent is a land you play, players can’t respond before you get the city’s blessing. 1/19/2018 Some cards have triggered abilities with an intervening “if” clause that checks whether you have the city’s blessing. These are worded “[Trigger condition], if you have the city’s blessing, [effect].” You must already have the city’s blessing in order for these abilities to trigger; otherwise they do nothing. In other words, there’s no way to have the ability trigger if you don’t have the city’s blessing, even if you intend to get it in response to the triggered ability. 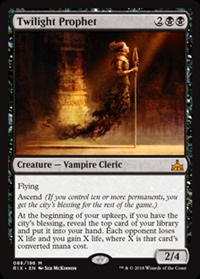 Has a great ability, decent toughness, flying...and vampires in Standard will have enough bodies to accommodate ascension relatively easily. Not to mention my commander deck. All around, a very good card. If you can get the city's blessing regularly (shouldn't be too tough in a go-wide Vampire token-style deck), this is extremely powerful. At absolute worst, it's getting you an extra land and not doing any damage/healing, but at best it's getting you extra cards while widening the gap in life totals. I think they meant, between games can you consistently get it. I meant more that if you can consistently get the 10 permanents out in order to get the blessing, which shouldn't be too tough to do with Vampires. At least, getting it done quickly. "If you can get the city's blessing regularly..."
Once you have the city's blessing you never lose it; this means 10 permanents doesn't matter after you have the city's blessing. It's explained on Magic: The Gathering's website, although, I feel like they'll probably change the rule after Pro Tour: Rivals of Ixalan. Seems like a lot of work to get most-recent Sorin's +1. Only problem I can see with this is that the VAST majority of cards in a go-wide vampire deck will be reeeally low cost creatures. Like who's the big target for this spell? Honestly probably your second copy of itself, which you don't want to draw anyway. Does this deck's curve go higher than 4?